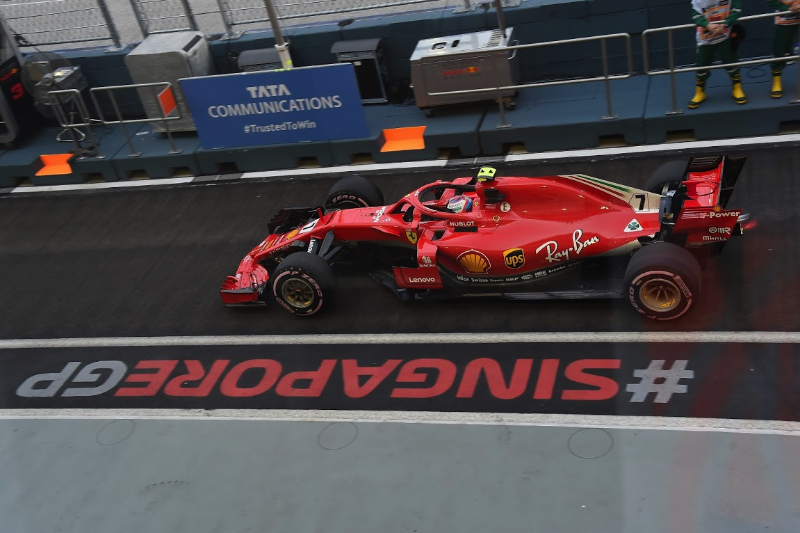 Ferrari's Kimi Raikkonen posted the fastest lap time in Free Practice 2, which is the most important of the three practice sessions for the Singapore Grand Prix. FP2 is held in the evening and begins at 8:30 p.m. local time- around the same time as qualifying and the race - whereas FP1 and FP3 are held in the hotter afternoon. "FP1 is a little bit tricky with track evolution, but obviously you will get an idea of the car balance and overall performance," Valtteri Bottas explained. "Practice 2 is definitely the most important session here. It is the most similar conditions to qualifying and the race, so getting clean laps, good feel of the car is very important. In FP3 you need to be cautious, as there are high track temps. If you're going to make big changes from Friday to Saturday, you will get an idea of it. The main thing is in FP2 to complete the program for Saturday." The line-up for the weekend was: Mercedes - Lewis Hamilton and Bottas; Ferrari - Sebastian Vettel and Raikkonen; Red Bull TAG Heuer - Daniel Ricciardo and Max Verstappen; Racing Point Force India Mercedes - Sergio Perez and Esteban Ocon; Williams Mercedes - Lance Stroll and Sergey Sirotkin; Renault - Nico Hulkenberg and Carlos Sainz; Toro Rosso Honda - Brendon Hartley and Pierre Gasly; Haas Ferrari - Romain Grosjean and Kevin Magnussen; McLaren Renault - Fernando Alonso and Stoffel Vandoorne; Sauber Ferrari - Marcus Ericsson and Charles Leclerc. Ricciardo was fastest in FP1, turning a 1:39.711 on the hyper soft Pirellis. The other two tire compounds were the super soft and ultra soft. Grosjean was first out in FP2. The ambient temperature at the start of the 90-minute session was 84 degrees Fahrenheit (29 degrees Centigrade) and the track temperature was 95 degrees Fahrenheit (35 degrees Centigrade). Vettel, on the ultra softs, got things rolling with a time of 1:40.922. Hamilton, second fastest, locked up his brakes and had to go straight on at Turn 14 while trying to pass said Vettel. Hamilton flat spotted his tires and pitted for a new set of Pirellis. Raikkonen, meanwhile, got down to a 1:40.510. Verstappen, Ricciardo and Vettel, rounded out the top four, and a mere 0.123 of a second separated that top four as the thirty-minute mark approached. Now Mercedes tried the hyper soft tires for the first time, and Bottas posted a 1:39.368 after narrowly missing a wall in the final turn. Hamilton's qualifying simulation produced a time of 1:38.710, which Raikkonen beat with his own 1:38.699. More qualifying sims were underway. Ricciardo's was only good for fourth best. Verstappen replaced his teammate in fourth. Vettel was having a go now on the ultras, and he brushed a wall in the final turn and pitted. He would have set the fastest time but instead now had a car that was leaking some sort of coolant fluid. So at the midpoint of FP2, and with many of the qualifying runs completed, the top runners were Raikkonen, Hamilton, Bottas, Verstappen, Ricciardo, Sainz, Grosjean, Alonso, Vettel and Hulkenberg. Now the drivers began long run simulations on the soft and ultra soft tires. These runs, too, were crucial because the track and weather conditions were similar to what they would be in the race on Sunday night. Vettel was out of his car which was undergoing repairs in the Ferrari garage. Thus he was missing vital track running. The top 10 at the end of the important FP2 were: Raikkonen, Hamilton, Bottas, Verstappen, Ricciardo, Sainz, Grosjean, Alonso, Vettel and Hulkenberg.